A historian of information and communications, Dan Schiller is an expert in the areas of telecommunications history, information policy, and the cultural production and political economy of capitalism. He has taught courses on these topics at the undergraduate and graduate levels. He is the author of half a dozen books and many research articles, and he has written extensively on the development and current structure of digital capitalism—the system of market relationships that is predicated increasingly on networks. 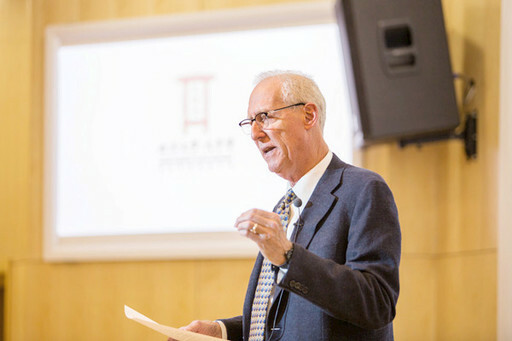 At the end of October last year, Dan Schiller, professor emeritus of Library and Information Science and Communication at the University of Illinois at UrbanaChampaign, was invited to China to deliver a series of lectures as part of Peking University’s Global Fellowship Program. In his lecture “The Geopolitics of Information in the Era of Digital Capitalism,” Dan Schiller offered a world tour of contemporary digital capitalism and reviewed the state of international competition for the coveted sources of profitable growth created by digital networks. After his lecture, a CSST reporter had a dialogue with him that shed light on the trends in Big Data and exposed the dilemma of humankind’s simultaneous deficit and surplus of information. CSST: How do you evaluate the trend toward what is called Big Data? Thus, we have a problem because we need to know whose instrumental purpose it is and what goals it serves. If the goal of Big Data is to preserve the fishing grounds of the people who have been fishing in some part of the ocean, maybe that is ok because maybe it can be used beyond that to preserve the fish as well as the fishermen. If, however, the goal of collecting and analyzing Big Data is to extract profit from any area of human interaction, direct or mediated by machines, then I am not so sure. Actually, I am sure: It is wrong. Because then Big Data is organized around the instrumental purpose of profit maximization, which is not only exploitative but also often carries what economists call externalities. It may have all kinds of other effects beyond the immediate goal of profit-making, but nobody pays for these—except the rest of us. Disease, environmental despoliation and inequality are primary examples. So how do we build the system of organizing Big Data if we need Big Data? And I am not sure we do need Big Data, because much of the data collection that is happening should not be occurring. We need a process of what in Europe and Canada they call data protection. I am not sure that is the right term, but I am sure that we need a policy or a structure of decision-making for data collection, as well as for data analysis. And this poses wholly new problems of political organization. Who should be making the policy, and on what grounds? Big Data thus poses profound questions. Because on the one hand, it gives new power to the units of big capital that are learning to exploit it for profit-making, while, on the other hand, it takes away power from everybody else, often without anyone knowing what, specifically, is happening. So we have a really big problem of balance—a power disparity— and, looking ahead, of a need for political creativity. The issue is partly about education. People know now that when they go online, they are giving up their data. They know that, but they don’t realize that when they turn on their washing machine, or when they open their refrigerator, or when they take a shower, or when they go to bed, they are giving data. We need a forum for the discussion and decision-making about which data ought to be generated and collected, by whom and for what reasons. Until we have that, we don’t have an answer to the problem of Big Data. CSST: Now that information is regarded as a commodity, could overcapacity in the information industry take place? Do we have too much information? CSST: Who is making the wrong information? Dan Schiller: It is not easy to find succinct answers to your question. The dominant institutions of capitalist society are making choices that you would expect because they are following the logic of profit maximization, and the result of their decisions is to produce too much of the wrong information and not enough of the right information. The answer to your question must be systemic rather than only individual. In terms of what can be done to correct this, the very first thing that needs to be done really cannot be overstated: Massive educational efforts are required to help people understand the consequences of what is in fact a devastatingly problematic political economy. We must have a huge effort to educate, because people don’t have any idea. They know that they are sick, but they look at and think about it as an individual problem, not something that is caused by the organization of society. Only through education may they learn this. But what we need is a systematic government-directed campaign that is not oriented toward the needs of any particular business or indeed toward business in general but that instead places the needs of the people in the foreground. I mean the great irony, the cruel irony, of digital capitalism is that this technology could be used for the most positive purposes. It could be used in the most beneficial ways to clean up the environment and to create a society in which justice rather than private profit would dominate decision-making—that is, to replace the whole system of institutions that produces the terrible outcomes that we now have. So I am not against the technology, but I am not for it either. The technology in itself is not the issue: The technology has to be seen in terms of the social relations in which it is encased. So we must try to produce a different set of uses and pressures and constraints for the technology, so that all over the world technology is dedicated to un-self-interested and genuinely human purposes. CSST: In your speech, you mentioned that the American idea of “free flow of information” was in fact refuted by the Economist decades ago. However, the idea is still advocated by some countries. What do you think of it? Dan Schiller: Free flow as a concept has great rhetorical appeal: It sounds like an uncomplicated ideal, something that is simply good for everybody. Actually, though, the concept is far from transparent. Under present circumstances, free flow of information is not a normative ideal but a political platform. The policy of free flow of information serves the interests of powerful US social and political actors, as indeed it has since before the Second World War, as Herbert Schiller showed in an article published 40 years ago. Free flow is a policy that the US companies and state agencies have used to advance their overseas expansion. By equating the free movement of capital with freedom of information, they arm themselves with a rationale for what they are determined to do anyway. In the actually-existing world of US transnational capitalism, free flow betokens not a genuine commitment to human rights but a self-interested slogan used to justify the current organization of profitmaking. To attain freedom of information for everybody—for all societies and, indeed, for all individuals—we will need to reconstruct the actually-existing political economy. Of course, there is still an authentic need for freedom of information. Universal freedom to formulate ideas in public and to exchange them with one another is a vital precondition for human well-being. How do we get from here to there? I don’t have a stock answer to that. It is one of the foremost challenges that we face. Corporations and states must not be permitted to set terms for us because, in my view, until and unless ordinary people set the standard, we will remain in trouble. But how we get to that, I can’t foretell.